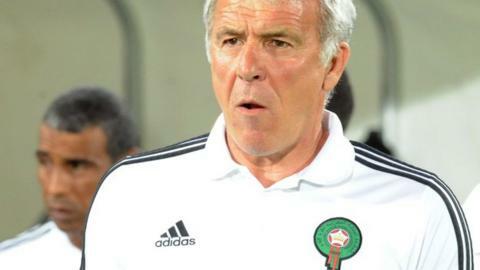 Morocco have sacked coach Eric Gerets following their first-leg defeat by Mozambique in the final-round qualifier for the 2013 Africa Cup of Nations. The 2-0 loss in Maputo on 9 September has left Morocco's hopes of reaching next year's tournament in South Africa in the balance. And the Morocco Football Association has acted quickly to end the Belgian's two-year reign. Gerets, 58, leaves the job after seven wins, six draws and seven defeats. His position had come under intense speculation after the loss to Mozambique and Morocco FA committee member Karim Alem told the official MAP news agency that Geret's contract had been terminated ahead of next month's return leg. He is the second coach in three days to lose a high-profile African job following Cameroon's decision to sack Denis Lavagne. The former Belgium international started well as Morocco coach after taking over in November 2010, having been hired as a charismatic presence in the country's bid to establish a new team in the wake of their failure to qualify for the 2010 World Cup and the Nations Cup in the same year. He guided Morocco to the Nations Cup in Equatorial Guinea and Gabon and his team were among the pre-tournament favourites. But they performed poorly and were eliminated after losing their first two matches, leaving Gerets clinging to his job. And his fate was sealed after the last Sunday's result.